The choice of the material when the box type vacuum furnace is made should pay attention to the following three points, so as to ensure the production of more and better products. 1. Generally, the power is calculated by one method, and the other or two methods are used to check and revise it. Power was determined, according to the partition of resistance furnace, power allocation, the form of the selected element, select material, calculation of its parameters, including cold resistance, power supply voltage, wire diameter, length. 2. Theoretical calculation of box furnace, the main parameters are output, temperature and temperature rise time. Experience calculation is often in three types: according to the operating temperature of the furnace volume and surface area and computing power or by the chamber of a stove or furnace temperature computational power or analogy calculated according to the varieties of the same stove output power. 3. 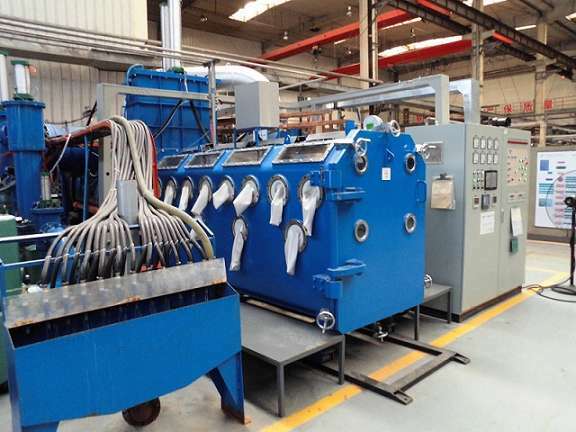 The concrete selection of the box furnace should consider the anti-oxidation resistance, high temperature resistance, anti-carburizing, process and surface load of the material. Strip heating element under the surface of the load bigger than filamentous heating element, can increase the highest 50 ℅.